Fr. Tyson is returning to the Bluff to be the Graduate Commencement speaker. Nice job by the University to have a former University president (1990-2003) to help shepherd those who sought to further their education out to the real world. Meanwhile, the undergraduates will have some guy who used to give speeches to college students for a living, allegedly possesses a quick wit and currently works for some company based in a small Connecticut city. Apparently he played football in college and worked in Indiana, Ohio, Arkansas, South Carolina, North Carolina, Minnesota and New York. Has anyone heard of Lou Holtz? Apparently he led Notre Dame to an undefeated season back in the 1980s. The Beacon has not posted the full articles online yet, but the full issue is online. Nonetheless great gets by the University and way to work the Notre Dame connection! I pity the kids who sit in the first couple of rows... Fortunately the will be wearing graduation ponchos to save them from the spittle. Man, don't be standing in the doorway when Dr. Lou fires up all those graduates and sends them charging out to conquer the world. As much as Holtz is a ND homer when discussing football on TV , from what I've read about him he seems like a good man. Frankly, I don't remember my graduation speaker (looking it up, it might have been Fr. Hesburgh), but I think I'd remember Dr. Lou. I'd take Lou any day of the week. I guess there a number of reasons for universities to invite guest speakers for commencement, but at one time it was all about an honorary degree for the speaker, followed by a sizeable donation to the school. With all that was going during the '60's when I graduated, you'd have thought we would have had a speaker at UP that would send us out into the world full speed ahead bringing about social and economic reform and ensuring justice for all. And maybe we did, but our speaker was the actress Rosalind Russell. I'm not saying Ms. Russell wasn't a real person, but she was an ACTRESS for god's sake. There were riots in the cities, assassinations, drug use at crazy levels, and most importantly, the Vietnam War was at its peak. But our commencement speaker is an ACTRESS! Again, I’m sure she was a real nice lady, but as the majority of the male graduates faced the prospect of Vietnam as soon as we lost our student deferment, it just appeared the Holy Cross administrators at UP were clueless. Or possibly, I didn’t have a clue. We soon learned that commencement is not for the students, it’s for the administrators and money! So, don’t complain about YOUR commencement speaker, at least he/she seemed to have a grasp on the realities of the world, if not the politics of the new graduates. Mine was the founder of Habitat For Humanity. Seemed like a sensible choice to me. While many seniors are beginning to feel stress over their upcoming graduation, senior Masis Isikbay, who is graduating a year early, has an added task to perform before he can receive his diploma: give a speech in front of the entire graduating class of 2012 and their families. Isikbay, a biology major and the University Scholar for the College of Arts and Sciences, is the 2012 University of Portland valedictorian. “I feel very flattered, very humbled, very honored to be valedictorian,” Isikbay said. 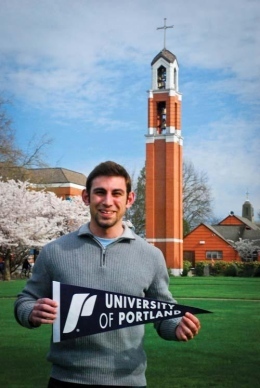 The valedictorian is chosen from a pool of University Scholars, students who have done exceptionally well throughout their years at the University of Portland. However, grades are not the only thing taken into consideration when selecting the valedictorian. Isikbay, who is also a resident assistant for Villa Maria Hall, believes the main reason he was picked to be valedictorian was because of the scientific research he has conducted and presented in conferences. “I think a big reason that I was chosen was through my undergraduate research experience and having the opportunity to go up and give a presentation in front of other people,” Isikbay said. Well put coach, whatever it was you said! Woodless, why didn't you think of handing out Dr. Lou wigs to the graduating seniors at commencement? It would have been a nice touch! Note to Woodless: You're next post will be #100, make it a good one!! !